1. Distracted Driving is any activity that can divert a persons attention away from the primary task of driving. Such distractions include: texting, talking on a phone (including hands free devices), eating or drinking, grooming, children and pets (children is huge right now as GHSA is trying to get the message out about being a responsible passenger), and adjusting the radio or MP3 players. 2. Sending and receiving text messages alone takes your eyes off the road for 4.6 seconds. This is the equivalent of driving 55 miles per hour the length of a football field with your eyes closed. 3. Nationally, in 2013, 3,154 people were killed in motor vehicle crashes involving distracted drivers. 4.10% of drivers under the age of 20 involved in fatal crashes were reported as distracted at the time of the crash. 5. 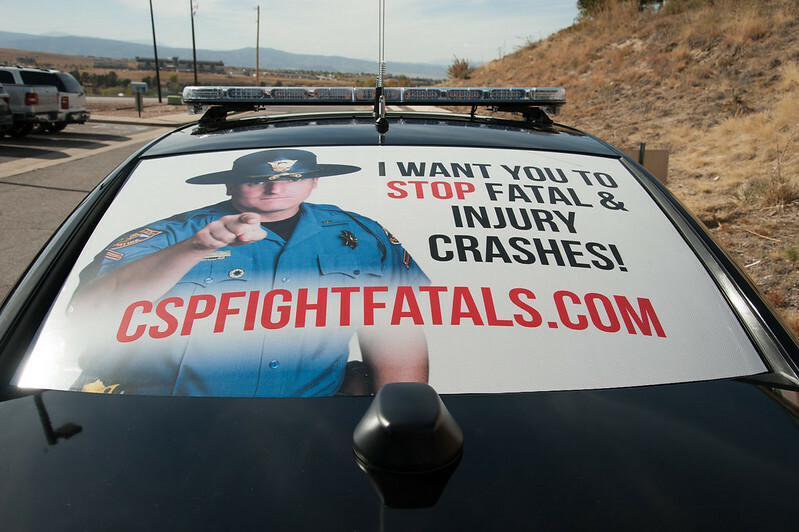 From October 2014 to September 30, 2015 the Colorado State Patrol has covered 36 fatal crashes resulting in 40 fatalities- all resulting from inattentive to driving. 6. From October 2014 to September 30, 2015 the Colorado State Patrol has issued 793 texting while driving citations. 7. In a study conducted by the Institute of Transportation management from April 29 through May 4, 2013; 24,022 drivers were observed and 15.6 percent of all drivers were distracted. 8. The counties in Colorado with the highest rate of texting violations are: Jefferson County, Castle Rock, Adams, Weld, Fruita/Mesa County, Colorado Springs, Pueblo, Ft. Morgan, Glenwood Springs, and Ft. Collins. 9. 20 percent of teens and 10 percent of parents admit that they have extended, multi-message text conversations while driving. 10. NHTSA research shows that drivers under 25 are two to three times more likely to read a text message while behind the wheel, while you passengers are less likely to speak up about the driver's dangerous driving behavior. To be clear, Colorado is a “No texting while driving” state. Zero tolerance! Nationally, over 26% of all motor vehicle crashes involve cell phone usage. high visibility and enforcement weekend.